The Keizer Art Association presented awards for its McNary High School art show Saturday, Feb. 3. 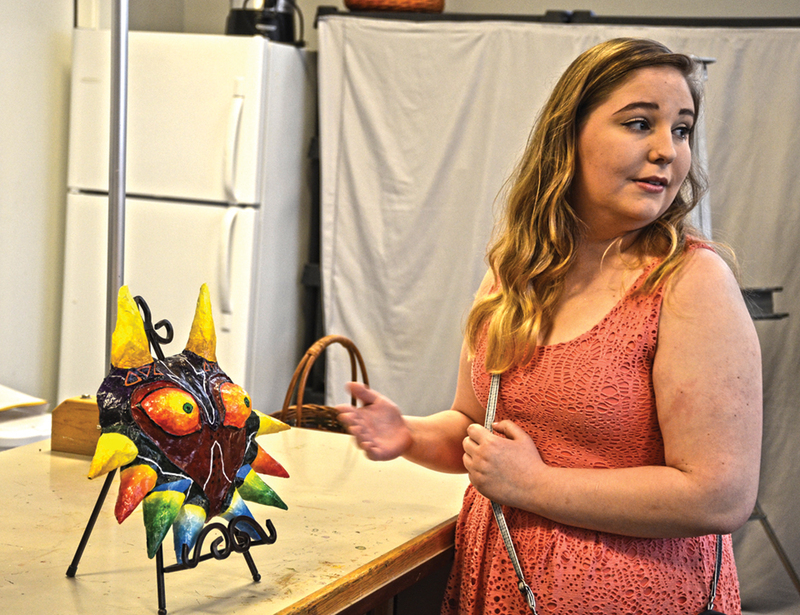 Elena Villegas won Best of Show for her Majora’s Mask, a mixed media mask based on the Legend of Zelda video game of the same name. Villegas’ entry was the first three-dimensional entry to take the Best of Show Award as far as the judges could recall. Josephine Lim took first place in three-dimensional art for her Companion Cube ceramic box based on the world of Portal video games. Birch Fox, by Ashley Sloan and Emily Daniels, took second place. My Worm Bowl, by Wocus Gibbons, took third place. A Juror’s Merit Award went to Death Slumbering by Laura Gillespie. Autumn Stanford took home an honorable mention for her altered-book sculpture Germany Burnings of 1933. In two-dimensional art, Madison Munro took first place for These Streets, a watercolor. Maddie Weathers took second place with Dog #2. Sweet Dreams by Lim won third. Two Juror’s Merit Awards were given to Emma John for Spring Water and Weathers for Ghosts of my Childhood. Honorable mentions went to Sunflowers by Munro and The Needle by Nicole Turner. In photography, Beauty in Peru by Allison Morgan took first place. The digitally-altered image features a child peering out of what looks like a play structure. Shiloh by Bailey White took second place. Ghana Schoolhouse by Melissa Morgan and Underwater on Rock Bottom by Emily Alger tied for third place. Juror’s Merit Awards went to Skate in Motion by Jordy Tellez and Pink Army by McKenzie Beard. Honorable mentions went to Blip by Beard, Directions by Jordan Marshall and Light in the Dark by Sarah Eckert. The artwork will remain on display at the Enid Joy Mount Galley in the Keizer Heritgae Center through the end of the month.